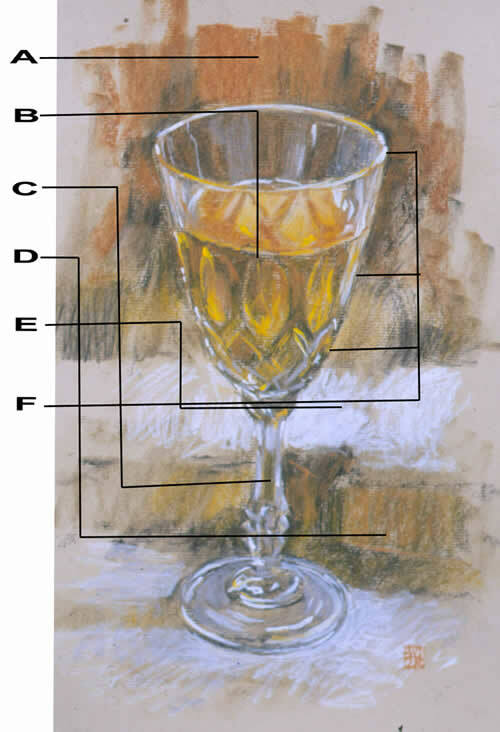 This workshop, combined with Part 2 is designed to help you understand the basics of sketching with Square Pastels . Sketching pastels are usually available in sets of a limited range of colours. Pick out smaller range of family colours. Select a light colour. With tip, draw out symmetrical form in line. With flat side edge, block in middle values as solidly as paper texture allows. Compressed paper wiper forces pastel into surface and creates soft directional strokes. Pastels, far from being poor relations to the other painting media, can possess a strength and quality unique to themselves. Of all the media, I firmly believe that pastels are the least understood and appreciated. For those who have never tried them, they more resemble pencils than paint. Most of the misunderstanding stems from the manner in which pastels are presented. Pastels come in many varieties, including watercolour, oil and dry form. Dry pastels are available in many degrees of softness and qualities. Softness is an intrinsic quality of working with dry pastels, as it dictates exactly how material can be employed. It is therefore, essential to understand what to look for. These can be square or round and are often termed 'Soft Pastels'. They are however harder than the Artists' Soft Pastels and can be easily distinguished by gently drawing one across the palm of your hand. Sketching Pastels will leave much less pigment on the skin. Square 'sketching' pastels, which are harder than the Artists' Quality Soft Pastels, are available in a limited colour range and this limitation demands that a bold approach is used. The quite different subjects chosen are intended to excite your imagination! A. Solid colour can only be achieved by forcing the pastel into the texture (tooth) of the pastel paper. These soft, dark areas of solid colour are an excellent foil to the staccato highlight strokes. Keep unfocussed so that the highlights can be seen sharply against them. B. Stark black becomes more acceptable when overlaid with other colours. Different pressures on the overlaid colour determine the degree to which the black shows through. Even when heavily covered, its presence darkens the overlaid values. C. The secret of transparency is simply to allow colours and values to show through from behind the glass. Highlights then establish the sharp reflective edges of the cut crystal. 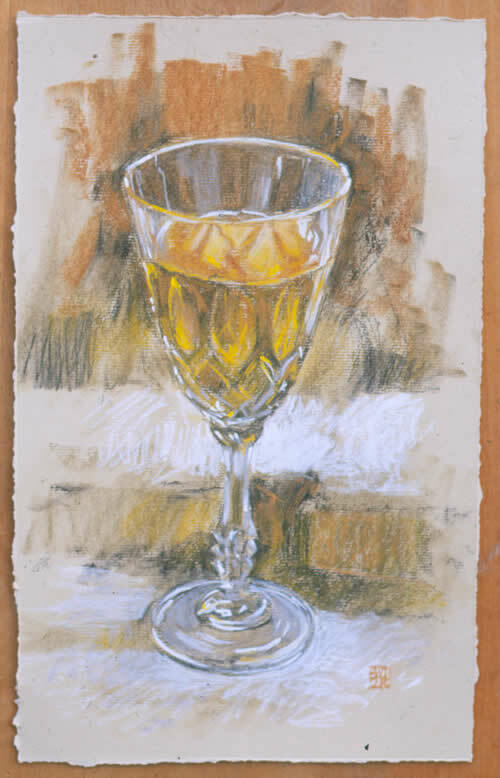 D. Allowing the pastel to ride the texture of the paper, rather than pushing it fully into its bed, encourages the surface of the paper to become a textural feature. The colour of the paper, peeping through, is also allowed to play its part. E. White works as a colour against the coloured pastel paper. Here it provides a sparkling light, which defines the edge of the glass (negative drawing - a drawing of the space rather than the object). 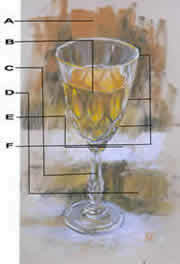 F. Definition along the silhouette edge of the glass varies from hard to soft, dark to light. The glass is hard, but the surface at the edge is moving away. Should the edge become too hard, the glass will 'lift' from its background. Too soft and the hard material will seem like cotton wool. Limited colour range demands use of black for accents. Black is enriched by overlaying middle value colours. Further blending solidifies colour blocks... ...and mixes colour layers - black re-emerges. Re-apply middle value colours to once again add richness to the black. White rubbed gently into surface gives soft lights (surface mixing). Hard pastel highlights need real pressure to adhere - often causing shape or size of highlights to distort. If so, scratch away excess with erasing or pen knife.